Gist clues: These are the most challenging and subtle because they require readers to infer meaning from the text (“John burst out of the woods and found himself at the edge of a precipice. Clinging to a boulder, he gazed down dizzily at the blue ribbon of river below”) (183-187). Adapted from Janet Allen, “Mastering the Art of Effective Vocabulary Instruction.” Adolescent Literary: Turning Promise into Practice. Ed. Kylene Beers, Robert Probst, Linda Rief. Portsmouth, NH: Heinemann, 2007 (87-104). 1. Teachers compile a manageable list of target words for a unit of study or text. One or two target words per week is reasonable. On day one, teachers read aloud the first target word to students and invite them to brainstorm what they know about the word. 2. Teachers ask students what they associate with the word (images and/or related words). 3-4. Teachers ask students to search for word parts they might recognize to see if those word parts can be associated with their background knowledge and result in a prediction. 5. 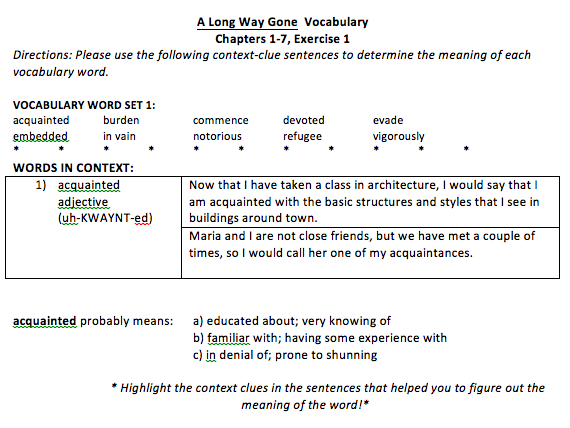 Teachers add context by distributing or displaying the word as it is used in context, preferably in the classroom text students will be reading from. 6. Students construct, independently or in small groups, a definition for the word and share/compare their definitions prior to opening their textbooks. 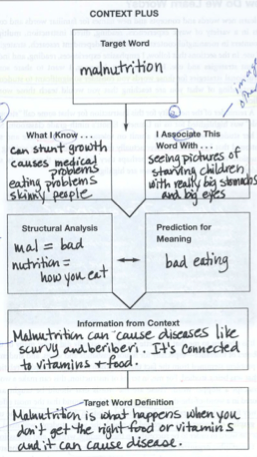 Click here for the Context Plus graphic organizer template. We truly know a word when we can effectively recognize and use it in multiple contexts. Though they may not think so at first, students often see and hear the unfamiliar words that appear on our vocabulary lists in many familiar settings. Words that are hard to pronounce: Make your own category. Find something that at least two words have in common! A complete understanding and mastery of new vocabulary words requires that students can recognize and use a word not only in the way it was originally taught to them. One of the most immediate ways to broaden understanding of a word is to use the word as more than one part of speech. "Is it enough to only know the word 'support' as a verb and not know it as a noun?" RHS teacher Sara Rice asks her students. "Hint: the answer is no!" Tier Two words are found across a variety of domains, and sometimes even highly specialized Tier Three words can be used creatively beyond the boundaries of a specific domain. In this activity, RHS English teacher Mary Ellen Dakin challenges students to transfer the Character Vocabulary words they are learning in conjunction with their reading of William Shakespeare's Macbeth from the brutal context of war-torn Scotland to the context of a modern restaurant. Home of the Hostile Hamburger! 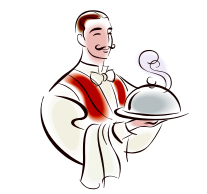 Food & Drink Sections: 15 words from your Character Vocabulary list are used in different sections of the menu. Each menu item contains a clue or explanation for what the vocabulary word means.